I blew a tire on Friday and then found a garter snake living in my garage on Sunday. I've had enough drama to last me a lifetime. I want boring days. I'll even take hot days. Right now, I'm just too much of a wimp to step into my garage. Mow the lawn? Forget it! It took me a while to step out to the yard after the last close encounter of the snake kind. This one is freaking me out even more. But that's just the tip of everything that's driving me nuts lately. I've come across a fair amount of FUD that Indian food is hard (to cook). No, it's not! If I can cook Indian food, anyone can. I'll tell you what is hard (for me): baking is hard and turning out perfect desserts like they do, is hard. Those who tell you Indian food is hard are either trying to position themselves as experts on Indian food or trying to recreate restaurant food at home with miserable results. Indian food served in restaurants around here is mostly made up and given fancy names. It is far too greasy and heavy cream is used indiscriminately. Korma? Makhani? Saag? Hello, heavy cream. Even in dal. And quite honestly, do you really want to mix mango purée with Cool Whip and feel happy that you made Indian mango ice-cream? Just like in the restaurants? Or that you made gulab jamun with Bisquick? Puh-lease! People tell me they love vindaloo and that they always order it when they go to an Indian restaurant. Should I tell them that the vindaloo they are eating is just a spicy meat dish in an onion-tomato sauce, nowhere close to the real vindaloo? That the aloo in vindaloo is not potato? That the heat shouldn't come from spoonfuls of red chilli powder but a fiery mixture of spices? Indian chefs, who know their food history, whip up delights that were served to Kings and Emperors. If we ate like that everyday - forget about your waist - your coronaries would be so clogged that you would be looking at a visit to the ER in your near future. Maybe there was a reason why the Kings died so young! Regular down-to-earth Indian food is not difficult nor is it very time consuming. I've heard over and over that there is too much prep time and cooking time is also very high. Let's face it: if you are going to eat a homecooked meal made with fresh ingredients, there will always be prep time. And, there will be cooking time unless you eat mostly raw food. 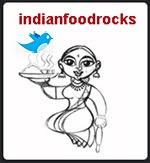 The problem lies in the fact that the very Indian food that it gets its fame from is not what we eat on a daily basis. Shaheen's Express Cooking Event led to an overwhelming number of 30 minute meals. Daily Indian fare is simple, nutritious and healthy. Tossing garam masala into something and then calling it Indian is yet another of my pet peeves. Do it by all means but call it Indian-inspired. I may sound like a purist but I am not. I think that cooking evolves, just as culture does. Chillies were not a part of the Indian cuisine but they are now an integral part of Indian food. And, believe it or not, toasting spices before grinding them into a fine masala is a given. Goda masala? Toasted. An everyday masala? Toasted. Punjabi Chhole masala? Toasted. So if someone tells you that their spice mix is unique because they had a eureka moment and tried toasting their spices before grinding them, hide your smirk and chalk it up to inexperience. Don't understand why toasted spices have such a different flavor? Let's just say there is a basic lack of understanding that there is a chemical change when heat is applied. What I can understand and relate to is that the ingredients may seem foreign, therefore daunting. It's how I feel when I go to South East Asian stores. 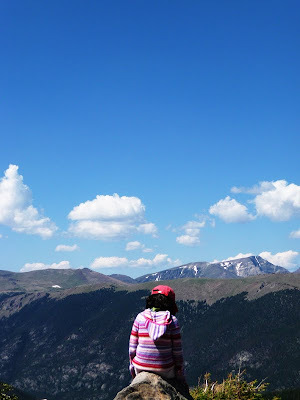 Overwhelmed, too. The list of Indian spices can seem endless, although a homecook will tell you that there are just about 5-6 basic spices that she uses on a daily basis. Mustard seeds, cumin, coriander seeds, asafetida, turmeric and red chilli powder are those spices for me. Kadipatta whenever available and green chillies, too. We also use a battery of legumes and grains that many non-Indians may not be familiar with. But let's not confuse lack of familiarity with difficulty, OK? Enough with the FUD and more of Indian cooking as it really is: not just for special occasions but daily food with a variety of flavors and textures. If you aren't familiar with Nupur's One Hot Stove or Shilpa's Aayi's Recipes, add these to your feeds as they present Indian food the way it is cooked every day. Visit Sailu's Food, too. There are many more blogs like these and what they have in common are the regional recipes I yearn for, that taste of home with flavor-filled memories. That's what I like to put on the table for my family and for my friends. 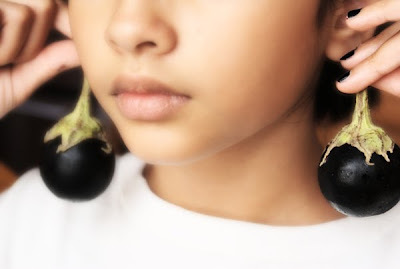 On that note, I want to share a simple recipe for aubergines or eggplant or brinjals. 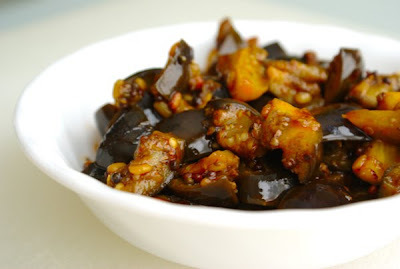 Eggplant was a much hated vegetable and I sought refuge under "too spicy" or "my tongue itches" whenever possible. It's a different story today and I am glad that I have an 11 year old with mature taste-buds, something I obviously lacked as a child! This is quick to put together and can be had with rotis or rice and dal. It's often called eggplant stir-fry but the vegetable is covered and cooked well so I am not entirely sure it qualifies to be a stir-fry. 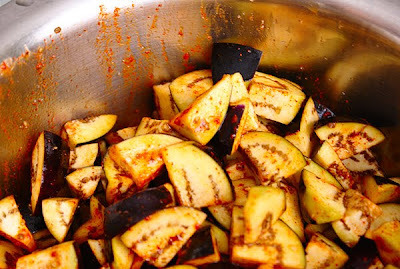 Some folks call it spicy fried eggplant - that's probably the closest you could get when it comes to translating its name but it's not really fried either. It doesn't look great nor do I have the patience to style it to look pretty which is why this post needed the picture below but I'll have you know that it's an easy, quick and nutritious veggie dish with the complex flavor of eggplant. Half-fill a medium saucepan with water. Dice the aubergines into 1 inch chunks and drop them into the water as you chop them to stop them from turning brown. Drain and sprinkle red chilli powder and salt. Heat oil in a saucepan and when hot, add mustard seeds. When the mustard seeds start popping, add urad dal. Sprinkle brown sugar and mix so that the tempered oil coats every piece of the vegetable. Cook on medum heat for about 5 minutes. If you feel that the aubergines are sticking to the bottom of your pan or getting scorched, add a little water - just a tablespoon or so. This dish is not supposed to have any sauce. Cover and cook until the aubergines are tender and cooked. Serve with rotis and yogurt or as a side with dal and rice. Typically, jaggery is used instead of brown sugar. Since I do not have access to organic jaggery (is there such a thing?) and I am not impressed with the chemicals used to commercially process jaggery, I buy very little of the stuff. I have also had the misfortune to find a metal staple, jute fibers and other impurities in jaggery that I prefer to substitute it with organic brown sugar instead. The flavor is not quite the same but that's fine with me. use more red chilli powder if you want to up the heat or if your chilli powder is not potent enough. Variations of this talasani include adding a large clove of julienned garlic to the oil. I also like to add asafetida after I add mustard seeds. You could also switch out the aubergines for other vegetables: zucchini does very well when cooked this way. As does ivy gourd. In other news, Flower Fest has been born again and this time, we're doing flowers by color. Purple is our first color and the last date for sending in your entries is August 25. So find your flower and sketch, paint, doodle or take a photo. Do what you do best or try your hand with another medium but do it! You don't have to be a blogger to participate; loving flowers is enough!